ESPN is laying off around 100 employees, including anchors, reporters and writers who have covered everything from the NFL and NHL, as well as college football and basketball. Among the employees who announced on Twitter that they are no longer working for ESPN are Jayson Stark, Trent Dilfer and Ed Werder. ESPN president John Skipper released a statement to employees today. Officials from Bristol, Connecticut-based ESPN said the majority of the nearly 100 layoffs are not based in Connecticut. A tweet from ESPN PR said, "Managing change involves difficult decisions ..."
Jayson Stark Tweeted that today is his last day covering baseball for ESPN after 17 years. Veteran ESPN reporter Ed Werder tweeted that he was informed that he was being laid off, effective immediately. Trent Dilfer was also let go and announced that he was laid off on Twitter. “Our content strategy – primarily illustrated in recent months by melding distinct, personality-driven SportsCenter TV editions and digital-only efforts with our biggest sub-brand – still needs to go further, faster…and as always, must be efficient and nimble," Skipper wrote. He added that "dynamic change demands an increased focus on versatility and value, and as a result, we have been engaged in the challenging process of determining the talent—anchors, analysts, reporters, writers and those who handle play-by-play—necessary to meet those demands." The statement went on to say that beyond changes to the company's talent lineup this week, a handful of new jobs would be posted "to fill various needs." “These decisions impact talented people who have done great work for our company. I would like to thank all of them for their efforts and their many contributions to ESPN,” Skipper wrote. Sports and entertainment industry watchers say reductions are ESPN were inevitable since they've been responsible for the economics of the the industry changing for decades. ESPN's media and broadcasting rights agreements with the NFL, NBA, MLB, MLS, and NCAA are all expensive enterprises and the company needs to figure out ways to monetize all of them so they make sense for the bottom line. 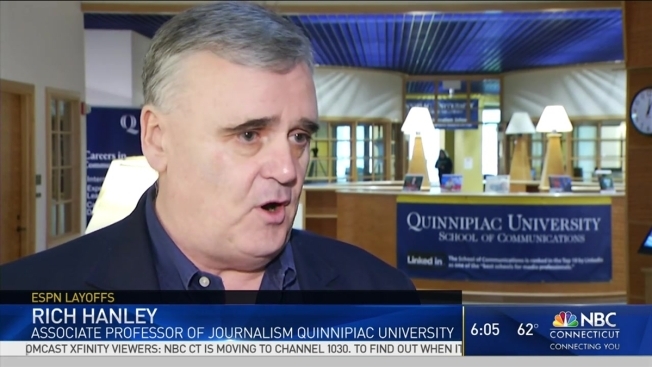 Rich Hanley, an Associate Professor of Journalism at Quinnipiac University, says the layoffs announced Wednesday, and the significant reduction in October 2015 are indications that the company has struggled to keep the money flowing in. “ESPN has to adjust, adapt to not only the coverage of the game but what it has on before the games, during the games, and after the games," he said. In addition, with more people "cord-cutting," the practice of cancelling cable television subscriptions and relying solely on the internet, has been another hit to ESPN's cable-heavy business model. It's estimated that ESPN lost more than nine million subscribers in 2016. The State of Connecticut also has a stake in ESPN's success. ESPN is part of the state's "First Five," economic incentive program. ESPN had to invest $150 million in its Bristol campus, and hire 150 new employees in Bristol by June 15, 2015 in order to receive $10 million in total tax incentives that they could spread out over multiple years. The company quickly complied by investing $200 million in its Bristol headquarters, and it hired more than 150 people. Catherine Smith is the Commissioner of the Department of Economic and Community Development, the agency that administers the First Five program. She says the layoffs at ESPN are part of the corporate ebb and flow, and she's not concerned about the company defaulting on its commitments. According to DECD, 20 of the 100 layoffs affect Connecticut employees with the rest being located outside the state. “Tied to the news ESPN President John Skipper shared with ESPN employees this morning, we first wanted to thank our colleagues for their collective contributions. “Perhaps the most noted example of this strategy is our recent approach to our flagship program, SportsCenter. SportsCenter with Scott Van Pelt, the launch of SC6 with Michael Smith and Jemele Hill, and the debut of more digital-only content socially and on our App means SportsCenter in its many forms is easily accessible, informative and primed with personality. “Our evolving ESPN App is the best mobile destination for sports fans and has been bolstered by the recent launch of home screen video and increased personalization. On the horizon is more live news video and enhanced video and audio streaming. “There are numerous examples this year of ESPN’s multi-screen approach around big events, ranging from the College Football Playoff Championship Megacast, the NBA Sidecast, the Tournament Challenge and Fantasy Football Marathons, and the Women’s Final Four. And at the start of NFL free agency, ESPN3’s show featured “Schefter Cam” while ESPN.com and the App were providing extensive clips featuring our NFL reporters and analysts, and ESPN2 wrapped it up with a comprehensive show. “And on the immediate horizon, three days of NFL Draft TV coverage will be complemented with even more online (which can be personalized to match a fan’s favorite team), the cover package of ESPN The Magazine, Mike & Mike and First Take on location, behind-the-scenes coverage on Instagram Stories and more. In May, two of our biggest journalism brands — Outside the Lines and E:60— will relaunch with an emphasis on increased collaboration and a larger presence digitally, socially and across all our screens. “All this in addition to the extensive coverage this spring of NBA Playoffs, Major League Baseball, Indy 500, the men’s and women’s College World Series, and more.